The supraorbital nerve block is often used to accomplish regional anesthesia of the face because it offers several advantages over local tissue infiltration. A nerve block often achieves anesthesia with a smaller amount of medication than is required for local infiltration. In addition, unlike local tissue infiltration, nerve blocks can provide anesthesia without causing tissue distortion. Therefore, the supraorbital nerve block is a convenient alternative for situations such as facial lacerations in which tissue distortion would be unacceptable. In general, regional anesthesia is ideal when the area of interest is innervated by one superficial nerve. [1, 2] The supraorbital nerve supplies sensory innervation to the upper eyelid, forehead, and scalp, extending almost to the lambdoidal suture (see image below). Since the supraorbital nerve provides a considerably large area of sensory innervation, it is a prime candidate for a regional nerve block. See the image below. Area of anesthesia for supraorbital nerve block. The trigeminal nerve (cranial nerve V), provides sensory innervation to the face. [3, 4, 5] The first division (V1) is the ophthalmic nerve, which splits into the lacrimal, frontal, and nasociliary branches. The frontal nerve then further divides into the supraorbital nerve and the supratrochlear nerve. 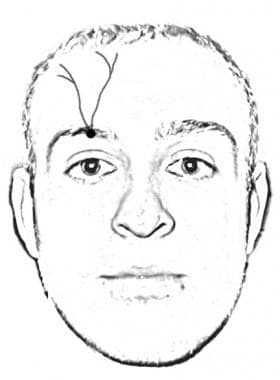 The supraorbital nerve exits the skull through the supraorbital foramen (giving off palpebral filaments to the upper eyelid) and travels toward the forehead, ending in a medial branch and a lateral branch (see image below). These branches supply the integument of the scalp, reaching nearly as far back as the lambdoidal suture. For a detailed description of orbital anatomy, please see the Medscape Reference Orbit Anatomy article. A supraorbital nerve block requires 1-3 mL of the chosen anesthetic agent. The supraorbital nerve exits the supraorbital foramen, which lies approximately 2-3 cm lateral to the midline of the face, at the inferior edge of the supraorbital ridge. To locate the supraorbital foramen, have the patient look straight ahead and imagine a line drawn vertically (sagittally) from the pupil up toward the inferior border of the supraorbital ridge. Then palpate along the supraorbital ridge until a subtle notch is felt; this is the supraorbital foramen. See image below. Prepare the skin using sterile technique with a povidone-iodine solution (eg, Betadine) and sterile gauze. Using sterile technique, palpate the superior orbital ridge and locate the supraorbital foramen again. Using a sterile needle and syringe, raise a small skin wheal over the area. To prevent swelling of the anesthetic into the upper eyelid, several authors recommend firmly placing either a finger or a roll of gauze under the orbital rim. 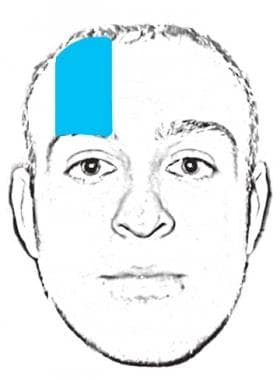 Slowly introduce the needle at a perpendicular angle immediately superior to the supraorbital notch (see image below). Eliciting paresthesia confirms that the needle tip is in close proximity to the nerve. If paresthesia is elicited, the needle must be withdrawn 1-2 mm before the anesthetic is injected to avoid intraneural injection. Positioning for supraorbital nerve block. To decrease the risk of directly injecting into an artery or vein, aspirate prior to injection. Taking care not to inject directly into the foramen, introduce 1-3 mL of anesthetic in the area of the supraorbital notch. If the needle tip is in proper position, slow injection of the anesthetic should be minimally painful and should meet no resistance. If paresthesia occurs during injection, the needle must be repositioned. If the nerve block is unsuccessful, a field block of the forehead is a useful alternative. This is accomplished by depositing a line of anesthetic solution along the orbital rim from the lateral to the medial aspect. This technique ensures block of all of the branches of the ophthalmic nerve. Chen YA, Rivera-Serrano CM, Chen C, Chen YR. Pre-surgical regional blocks in orthognathic surgery: prospective study evaluating their influence on the intraoperative use of anaesthetics and blood pressure control. Int J Oral Maxillofac Surg. 2016 Jun. 45 (6):783-6. [Medline]. Shin KJ, Shin HJ, Lee SH, Song WC, Koh KS, Gil YC. Emerging Points of the Supraorbital and Supratrochlear Nerves in the Supraorbital Margin With Reference to the Lacrimal Caruncle: Implications for Regional Nerve Block in Upper Eyelid and Dermatologic Surgery. Dermatol Surg. 2016 Aug. 42 (8):992-8. [Medline]. Gray H, Lewis WH. Anatomy of the Human Body: 5e. The Trigeminal Nerve. Bartleby.com. Available at http://www.bartleby.com/107/200.html. Accessed: May 13, 2008. Ilhan Alp S, Alp R. Supraorbital and infraorbital nerve blockade in migraine patients: results of 6-month clinical follow-up. Eur Rev Med Pharmacol Sci. 2013 Jul. 17(13):1778-81. [Medline]. Allam AE, Khalil AAF, Eltawab BA, Wu WT, Chang KV. Ultrasound-Guided Intervention for Treatment of Trigeminal Neuralgia: An Updated Review of Anatomy and Techniques. Pain Res Manag. 2018. 2018:5480728. [Medline]. [Full Text]. Amsterdam JT, Kilgore KP. Regional anesthesia of the head and neck. Roberts JR, Hedges JR. Clinical procedures in emergency medicine. 4th ed. Philadelphia, PA: WB Saunders; 2004. 552-566. Taleghani NN, Sternbach G. Facial and oral blocks: supraorbital nerve block. Rosen P, Chan TC, Vilke GM, Sternbach G. Atlas of emergency procedures. St. Louis: Mosby; 2001. 158-159. Trott AT. Wounds and lacerations: emergency care and closure. 2nd ed. St Louis, MO: Mosby; 1997. The authors and editors of Medscape Reference gratefully acknowledge the contributions of previous author Michelle Marie Davitt, MD, to the development and writing of this article.